You already saw my Big Days Commin’…Get some rest in my last post. Well with the rest of the 6″ swap blocks I had sorted out 50 of the green, red ones and made this quilt..I chose a gray background so that it would make my fabrics stand out but not harshly like white would have.. also some of the fabrics had white background so I wanted them to show up a bit. As I did with my last quilt I cut the background fabric into 6″ squares to match with the swapped squares… then drew a line diagonally on the back of the grey and sewed 1/4″ on each side of the line. cut apart and pressed towards the colored fabric. I really did not feel like doing applique for the outer border so a quick run into the christmas bin and I found a large floral motif with poinsettia and roses so i chose to fussy cut these and place them around in the corners and middle of the quilt border.. all i had to do now was to sew them on. With top done it was time to decide how i wanted to quilt this beauty.. Most fabrics have poinsettia and holies on them and of course the roses. So I began playing with ideas on how to incorporate these… I used Moda Fireside Red for the back… Here is the quilting and a quick drawing of what i quilted if you cant see it in the picture. My quilting looks way better than the drawing that I did afterwards. 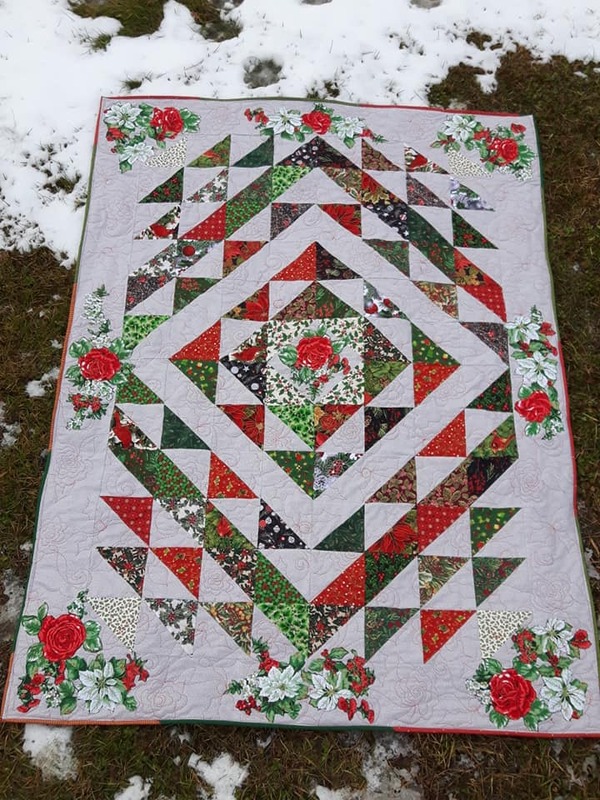 Quilted Bound… Finished product.. sophisticated Christmas lap quilt. My tip with this quilt is don’t let large printed Motif deter you .. cut it up the results can be amazing. These are the 3 that i’ve made so far.. now I’m taking all the scraps and making a crumb quilt with them. Are you getting in the Christmas mood yet? I am.. next week i pull out all my christmas wall hangings… then the house will begin to look festive.